We went whale-watching yesterday with some friends celebrating a birthday! It was our first time, and we really enjoyed it. Deer Harbor Charters is an excellent family business with knowledgeable captains and naturalists. Nate was our captain, and Trey was our funny — even humorous — naturalist guide. They both made the trip enjoyable enough we want to go again! Some nice things about the boat were: indoor benches and tables where we could still see out but also keep warm, high railing along all sides as well as the above-cabin viewing balcony, indoor bathroom, complimentary binoculars for your use during the trip, and even a few snacks and drinks for sale in the corner in case you get famished. The trip was relaxed, though we got quickly to where the captain knew we would have a good chance of seeing orcas. Once there, we spent at least an hour observing, then made our leisurely way back to Deer Harbor, still scouting out and finding wildlife along the way. You can see by his post on Flickr that Steve got some excellent shots of the beautiful beasts! The captain keeps a constant ear on the radio and an eye out the window for animals. I’d wondered how the whale-watching boats find something to see. The captain said there’s a good network between the companies so that they share with each other where to find the wildlife they are seeking. For Deer Harbor Charters, it sounds like the main focus is sighting and observing orcas. If they don’t show up, though, the captain guides the boat to where they might find a whale, porpoise, or seal. 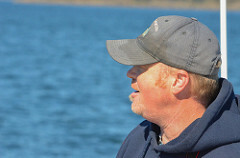 On this particular trip, Captain Nate not only took us to see the orcas, but he also found common murre, eagles, many other birds, harbor seals, Steller sea lions, and mouflon sheep (on Spieden Island) for us to experience. We learned from Trey some history of the islands, too. 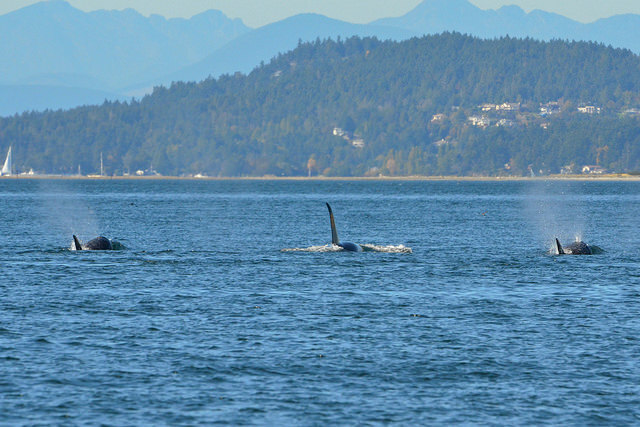 The highlight — the orcas — showed up! It was especially nice when the captain cut the engine so we could hear the orcas spout. Apparently, the ones we observed were a transient group, which rarely “speak” to each other (so they don’t spook their prey). The resident orcas, on the other hand, can be quite vocal. Each orca family has a different dialect, and the transient and residents have different languages. We learned a great deal in a short amount of time, and we highly recommend a whale-watching tour in the region! 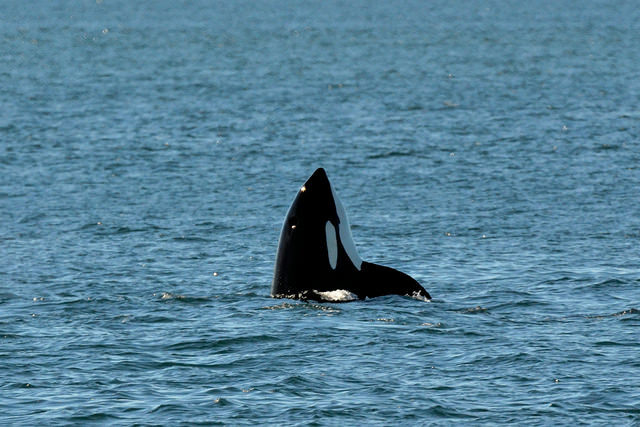 There are several orca pods that spend time in the Salish Sea. These include the Transients T65, which are what we saw on this trip. Their diet is other mammals, including seals. The other type are the Residents whose primary diet consists of salmon. Even though the two groups look similar, they do not interact with each other. 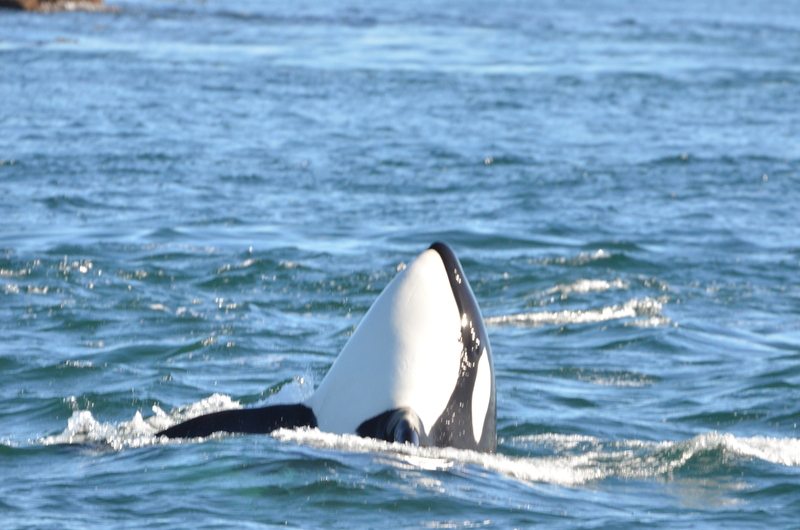 On the day we were out, the Transients were in range while the Residents were elsewhere. From Deer Harbor on Orcas Island, we traveled west about 15 miles and into Canadian waters. There were several other tour boats on station when we arrived. Apparently there are about 30 companies in the region, operating around a hundred tour boats of all sizes and shapes. A couple of things to consider when choosing a tour company is whether the boat has a restroom and a place to stay out of the wind. Another is how much room is at the rail. Everyone will typically end up on one side of the boat at the same time. Will there be enough room for you and everyone else? Whale watching is big business, and that is understandable. Not only are the orcas fascinating to watch but there are many other animals that grab the attention as well. Orcas are common, as are Humpback and Minke whales. We met up with the orcas near a tiny, uninhabited island called Mandarte which is about 5 miles east of Sidney, BC. There was a large bull with a huge dorsal fin that was at least five feet tall. I’m not sure how many were in the pod, but probably somewhere around eight whales. One would have to compare all of the dorsal fins or the saddle patches in order to get a count. I tried to find a list of the T65 pod members online; but, surprisingly, there isn’t much information on the group. There is a lot of research on the Resident populations but little on the Transients. 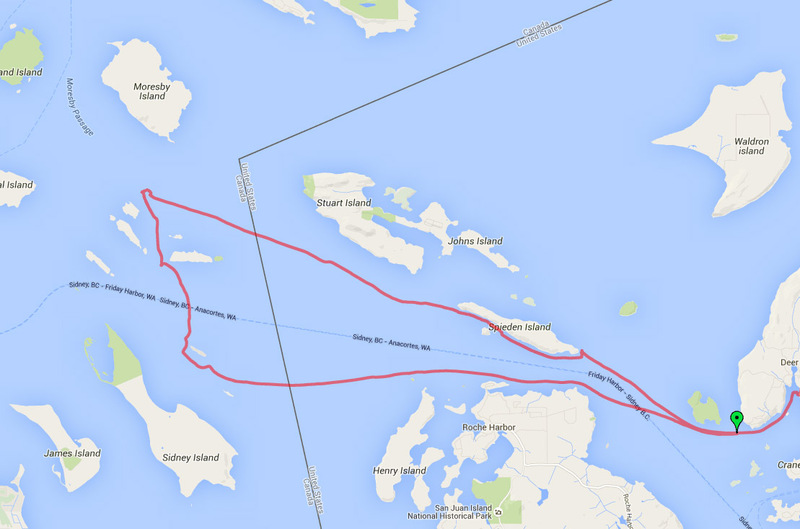 The whales took a leisurely path to the north between Gooch and Rubly islands and on past Brethour island. The orcas can move as fast at 30 mph but typically cruise around at 4 to 8 mph. Our boat, which seemed to have a cruising speed of about 15 mph, was able to easily keep up; they occasionally cut engines when the whales stopped to loiter someplace. The orcas spend most of their time underwater and can stay under for about 20 minutes before they have to surface. However, the ones we trailed rarely stayed under for more than 5 to 10 minutes at a time. They would porpoise a few times and then reappear a few hundred yards away. All of the boats keep their distance; but as it is difficult to know where the whales will surface next, there will occasionally be close encounters. None of the whales breached while we were watching, but there were several occasions when they spy-hopped, which is basically a vertical poke up out of the water to look around. We enjoyed the trip and had great weather; it was about 60 degrees with little wind and clear skies. NOAA has tagged some of the whales with transponders. Apparently, the whales are able to remove the tags and to recognize the boat that did the tagging so that that boat can be avoided in the future. Deer Harbor Charters finds that they are typically busier on the weekdays and less busy on the weekends. They give tours year round. All photos on this page and on the linked Flickr page were taken by Steve Smith.